What is public_html folder ? Or put another way, when someone types your domain name into their browser, whatever is in the public_html folder is what will be shown to them. For example, if you have a file called index.html (or any of the other default filenames) in the public_html folder, it will display that page. If you do no have a default file in the public_htmlfolder (such as index.html, default.html, etc. 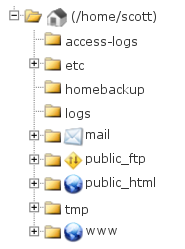 ), then a list of files in the public_html folder will be shown. Replace example.com with the primary domain on your account (the one you originally signed up with, unless you changed it).